Trump International Golf Club Dubai is first of two planned Trump-branded tracks in the Middle East. DUBAI—The day after the executive order commonly known as the Muslim Ban came down, I was at San Francisco International Airport, on my way to the Middle East. As I waited in the security line the terminal was suddenly flooded with hundreds of citizens who were protesting President Trump and the most recent of his controversial policies. They were waving signs, pounding drums and playing brass instruments, chanting and singing. It was quite the soundtrack as I went through the onerous security procedures that were put in place in the aftermath of 9/11. I was bound for the United Arab Emirates, which birthed two of the September 11th hijackers, and from where some of their financial support originated. Yet politics can complicate any relationship. 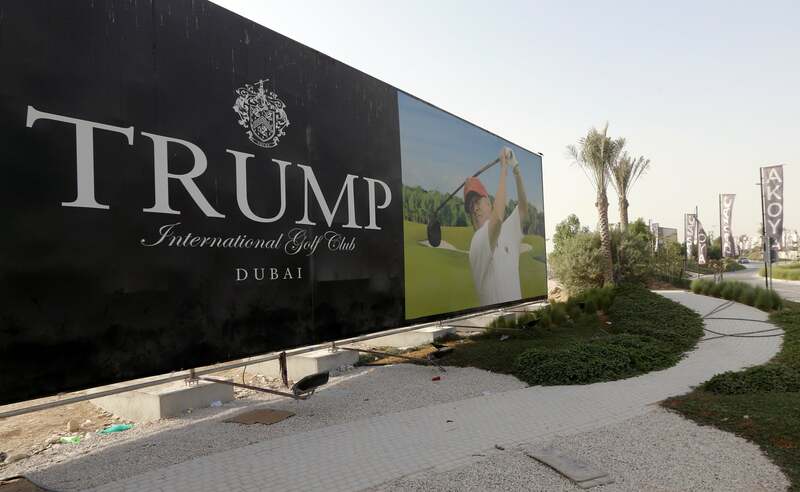 During the presidential campaign, as Trump was ratcheting up his controversial rhetoric about Muslims, the five large gold letters spelling the President’s name were temporarily removed from the entrance to Trump International Golf Club Dubai. It was a powerful symbolic gesture. This week I journeyed to Trump’s Dubai property to get a look at the place for myself. Talk about globalism: My Ethiopian cab driver spent the entire drive bumping American hip-hop. The course is 20 minutes from downtown, past endless construction sites. I started counting cranes but became bored and gave up after I got to 30. Many of these luxury homes are snapped up by Saudi and Iranian buyers, offering a safe place to park their money outside of their politically volatile home countries. (Iran is one of the seven nations named on the Muslim Ban, but Saudi Arabia, which supplied 15 of the 9/11 hijackers and is the country in which Osama bin Laden was born and raised, is not.) Someday, sooner rather than later, the oil will run out across the Middle East. What will become of all these oversized houses? Will the desert reclaim them? That’s a reckoning for another day. The lettering announcing the Trump International Golf Club Dubai has been restored, in all of its gaudy glory. Next to the striking, modern clubhouse a giant stage was being built for the grand opening gala in a couple of weeks. Some 2,000 guests are expected, including both of the President’s sons. Even for Tiger Woods, being linked with the President is complicated. Five minutes from Trump Dubai another massive development is being carved out of raw desert. Trump World Golf Club Dubai is slated to open in 2018, and Woods is designing the course. “My father and Tiger have been friends for a long time,” Eric Trump said in an exclusive interview with Golf.com’s Pete Madden. “They’ve been very, very close. When you combine Trump and Tiger, it’s a match made in heaven. It’s a very amazing combination." As the President told GOLF’s Joe Passov in 2014, "Hussain (Sajwani), my good friend and chairman of Damac, acquired this huge piece of land. He’s one of the world’s great developers and he wanted this project to exceed every expectation. When we discussed the golf course architect, we agreed that there was only one choice: Tiger Woods." On Thursday, after playing the first round of the Dubai Desert Classic, Woods made a site visit to Trump World. Three holes have been shaped, and Tiger was “pleased with the progress,” according to his agent, Mark Steinberg. “It looked good, it looked cool.” How much discussion has Woods had with Trump about the project? “Very little,” said Steinberg. This is the new reality at the complicated nexus of golf, Trump and politics: The President is both an invaluable asset and the source of widespread controversy. Things will continue to be messy as long as golf is a major export of the President of the United States. The Trump Organization is currently pursuing a project built around an Ernie Els-designed course in Indonesia, which has the largest Muslim population in the world and has become a base of operations for Islamic State cells. Ban or no ban, Trump’s golf business rolls on.